When buying our products they sometimes contain instructions on using certain measurements. We advise that you do not use your normal measuring supplies at home to measure out things for the insects, pets, etc. 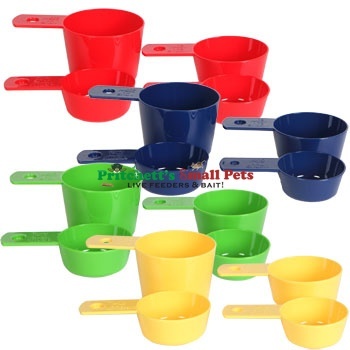 We offer a set of measuring cups that we use ourselves for measuring things out for our pets. Nesting measuring cups are perfect for measuring dry/solid ingredients — plus, a plastic ring keeps them all together for easy storage and use. Each set includes 1 cup, ½ cup, 1/3 cup, and ¼ cup measuring scoops. 4-piece sets of nesting measuring cups assorted among blue, yellow, green, and red. Click the button below to add the Measuring Cups to your wish list.